Hey Pais Valentines now for sale! EDIT: PayPal buttons should be working now! Sorry about that everyone! EDIT, January 11th 2010: PayPal buttons have been disabled to avoid confusion! Hey guys. Yesterday I promised you a thing. And now here is that thing! I made two sets of four valentines. 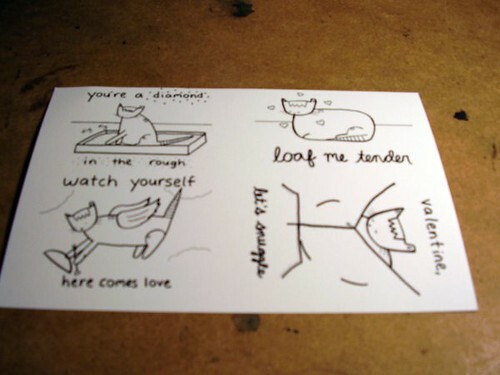 The first four, "Cat Valentines" are just regular cat jokes. The second four, "Nerd Valentines," have nerdy jokes from tv and stuff. 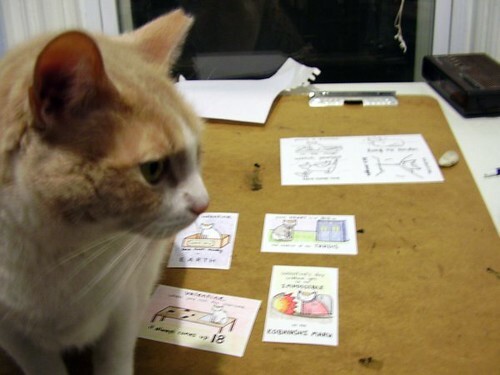 They are little cards, like the ones you had in elementary school (this is what the girl said, I didn't go to school, I am a cat). They are 2.75" by 4.25" and are printed four to a half-sheet. They are on nice white photo paper that has been made by science for printing on both sides. The back each valentine says "happy valentine's day" and has a space to put who it is to and who it is from (or you can put that you are a secret admirer!). There are also dotted lines for cutting. The nerd jokes are about Star Trek, Battlestar Galactica, Dungeons and Dragons, and Dr. Who. For size and prettiness reference here is a picture of me with some valentines. Okay now I am going to tell you how to buy them! The more you buy the cheaper they get. It is a little bit more to have them colored in. Maybe you want them black and white though so you can color them yourself. Shipping is included, just make sure you click the right button for where you live. In the little text field tell me if you want cat jokes or nerd jokes. You can get one set of each, or two sets of each, or any number of anything. 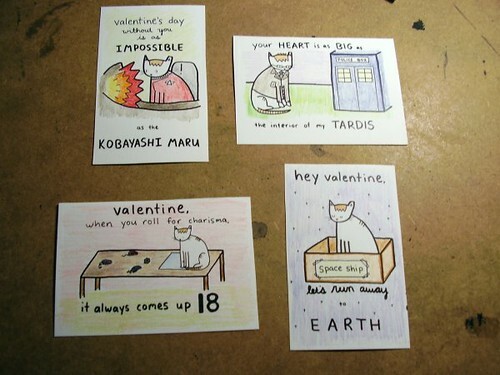 If there is one specific card you want a lot of (like maybe you are going to a Dr. Who convention on Valentine's Day) email me (pais at heypais dot com) and we can discuss that. If you don't tell me which kind you want I will probably just choose for you but you might not want that! I hope that this all makes sense, it is a lot of typing for a cat. Be sure to order soon if you want them in time to give to someone on Valentine's Day! Thank you for reading this, I love you guys! Oh, Pais! You sure are a bea-u-tiful kitty! Oh thank you! I am very fastidious. your valentines are really cute, pais! Hey Pais, I made my order and sent you an email to ask a special favour. You really are a beautiful kitty! 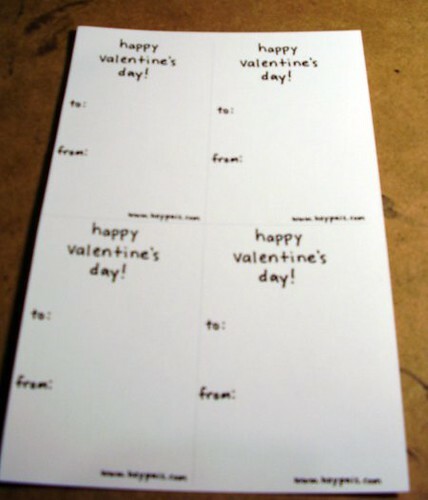 I am putting your valentines into the mail today! I hope you like them! Thanks Jess Bess! I love you! That Dr. Who card is molto bene! Oh thank you! If you want four Dr. Who cards I can do that for you. I'm very clever! Four whole Dr. Who cards!!! I would love that very much! How should I make that happen?